Thank you to everyone who attended the 2016 DCRC annual meeting in Columbus, Ohio! We had a very successful meeting, with a fantastic program, outstanding networking opportunities and great attendance with nearly 300 registrants on-site. We are grateful to our loyal sponsors who graciously help make this event—and all of our activities throughout the year—possible. Thanks to those who attended for the first time and welcome back to everyone who has attended our annual meeting in the past—we hope you all enjoyed the meeting and look forward to seeing you and even more attendees at our 2017 annual meeting in Reno, Nevada, November 8 – 9. Please note the annual meeting will take place on Wednesday – Thursday next year. Thanks also, to past-president Stephen LeBlanc and the DCRC board and committees for their leadership and hard work over the past year in keeping the organization pointed toward our goals. As a result of their dedication, our membership and sponsorship are up, and we’ve increased the number of educational webinars—including adding content for Spanish-speakers. Also, the reproduction awards program featured a record number of nominations—128 herds from 18 U.S. states and Canadian provinces. We’ll build on this momentum in the coming year, adding even more webinars in additional languages, as well as developing and updating our educational materials. And we’ll be working to bring you another excellent program for the annual meeting. Don’t hesitate to reach out to any of these individuals if you have questions, suggestions or would like to volunteer your time or resources to DCRC. Stay tuned for more information about future webinars, annual meeting details and more by visiting www.dcrcouncil.org, as well as the full DCRC leadership roster. Spread the word through social media—follow us on Twitter (@DCRCouncil) and Facebook. Your retweets and ‘likes’ help extend the reach of DCRC’s information and programs. It’s going to be a great 2017 for DCRC! A recent study at Kansas State University set out to determine the importance and contribution of several physiological factors as pregnancy predictors in an Ovsynch® timed artificial insemination program. The results were published in the December 2016 issue of the Journal of Dairy Science. A combination of these factors to predict pregnancy risk. High ovulation response after gonadotropin-releasing hormone preceding the fixed-time AI. Predictions had accuracies exceeding 85 percent with sensitivities exceeding 90 percent—identifying true positive responders for both ovulation and pregnancy risks. German researchers report findings of a new harmful haplotype in Holstein cattle in the November issue of the Journal of Dairy Science. A number of genetic disorders have been discovered in cattle over the years. However, the genetic background of disorders in calves is less reported. Recently, German farmers described calves from specific matings with chronic diarrhea and retarded growth of unknown cause. Affected calves did not respond to any medical treatment and died within the first months of life. These calves were underdeveloped in weight and showed progressive and severe emaciation despite normal feed intake. Blood biochemical analyses indicated hypocholesterolemia and deficiency of fat-soluble vitamins. To find the source of the problem, German researchers performed a genome-wide association study with nine affected and 21,077 control animals. Subsequent mapping identified a disease-associated haplotype. It has a significant adverse effect on calf mortality in the homozygous state when comparing survival rates of risk matings vs. nonrisk matings. Blood cholesterol values of animals are significantly associated with the carrier status indicating a codominant inheritance. The frequency of the haplotype in the current Holstein population was estimated to be 4.2 percent. Researchers recently conducted two experiments to test whether enhancing progesterone before inducing luteolysis or exposing cows to estradiol cypionate (ECP) or testosterone propionate (TP) after luteolysis would increase occurrence and intensity of estrus. The results were published online in the Journal of Dairy Science November 23, 2016. The goal of the Kansas State researchers was to determine if more cows could be detected in estrus by an activity monitoring system compared with other estrus detection aids. Cows were fitted with activity monitoring systems, a pressure-sensitive, rump-mounted device or a friction-activated, rump-mounted patch to monitor heat detection. CL + 2 CIDR inserts for five days. Prostaglandin F2α was administered to all cows upon CIDR insert removal or its equivalent. Results show progesterone concentration up to 72 hours posttreatment was greatest in CL + 2 CIDR, followed by CL only, and no CL + CIDR cows. 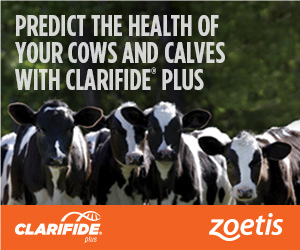 Estrus occurred 14 to 28 hours earlier in cows with no CL + CIDR compared with CL-bearing cows. In experiment two, cows were assigned to receive 1 mg of ECP, 2 mg of TP or control 24 hours after PGF2α. Results indicate concentrations of estradiol 24 and 48 hours after treatment were greater in cows that received ECP compared with controls. Estrus occurred 8 to 18 hours earlier and was of greater intensity. Of cows exposed to the activity monitoring system, rump-mounted device or patches, 70, 61 and 75 percent, respectively, were detected in estrus and more than 93 percent of these subsequently ovulated. The researchers conclude only ECP was successful in inducing more expression and intensity of estrus, and proportions of cows detected in estrus exceeded 80 percent. Given the large proportion of cows equipped with AMS collars ovulating in the absence of estrus, further research is warranted to determine if more pregnancies can be achieved by inseminating those cows not detected in estrus at an appropriate time when PGF2α is administered to induce luteolysis. The session highlighting the success of the Dairy Cattle Reproduction Council’s Reproduction Awards Program has become a crowd favorite. And this year was no exception as the organization celebrated the remarkable achievements of this year’s winning herds in Columbus, Ohio, November 10 – 11. DCRC was pleased to partner with Hoard’s Dairyman again this year to sponsor the Reproduction Awards Program. Awards were presented to Bronze, Gold, Silver and Platinum winners, with the Platinum winners participating in a panel discussion that featured reproductive tips and advice. The Platinum herds were also featured in a roundtable discussion in the November 2016 Hoard’s Dairyman. In total, 24 dairies—six in each category—were honored for their herd’s outstanding reproductive performance as measured across a wide range of specifications by a panel of independent, expert judges. The judges had their hands full, with a record 128 nominated herds from 18 U.S. states and Canadian provinces entering the program this year. After reviewing the farms’ data, the judges winnowed entrants down to 39 herds for further review. Ultimately, the field was narrowed to the 24 winning herds. While many factors and data points are evaluated throughout the process, the Platinum herds reached pregnancy rates ranging from 36 to 46 percent and all but one of the Platinum, Gold, Silver and Bronze herds attained pregnancy rates above 31 percent. Following is an excerpt from the recent roundtable that discusses the many “little things” that these impressive dairies do which translates into significant reproductive success. “One hundred percent compliance with all protocols is a must,” says Roger Dunn. “Keeping low densities in transition cow pens also aids our reproduction,” the Coudersport, Pennsylvania, dairyman went on to say about his dairy. “Having goals and direction helps to evaluate our operation,” says Brian Brown, Sunburst Dairy, Belleville, Wisconsin. “So does working as a team with everyone involved in our farm business,” adds wife Yogi. As for other factors, “Maximize housing and comfort, keep cattle calm and utilize a good nutrition program,” states son Cory. Copperhill: One of the biggest changes that we have made has been adding fans. We added fans over our head-to-head stalls and feed alley. This has dramatically improved reproduction, milk production and overall herd health. Our hoof trimmers, John Montagne and Lucas Kane, come more often than in the past. They come every other week and trim cows every six months. They do an excellent job only trimming what is needed and identifying hoof issues. We invested in our own hoof trimming chute so we can trim cows immediately when found lame. Most recently, we invested in newly designed foot baths to keep infectious diseases under control. Healthy feet keep cows active. Vaccinating against a combination of respiratory diseases and Lepto has really helped with EED (early embryonic death) loss. In the future, we may add fans to the outside rows of stalls to keep cows laying down even in the hot, humid weather. We would also like to add large water troughs in the parlor return alley. Dunlea: We built a tunnel-ventilated barn with steel side walls to stop radiant heat. We also have had solid operating procedures in place to deal with heat abatement and have not found the need to make any recent changes. All future milking barns will be similarly built, with cow comfort the foremost requirement. Pfeifer: The two newer barns have misters. That is a definite benefit. We probably should add misters to the older barn. Pine Hollow: Over the years we have continually worked to improve our older facilities. The older barns have water beds, rubber floors and tunnel ventilation. Our newer facilities have sand beds and regular mixing fans. We look forward to adding back scratchers when the dairy economy improves. Seidl: The barn floors were regrooved and we retrofitted tunnel ventilation. We soak cows in the parlor on hot days with water over the front shoulder and neck delivered with a 3/4-inch PVC pipe. We accomplished that by drilling tiny holes in the PVC pipe and mounted those pipes over cows in the parlor. SunBurst: With cows and heifers, we try not to stock at over 100 percent capacity. Pre- and postcalving areas are even understocked. We also focus on a calm and quiet, well-bedded environment for cattle. We use fans and sprinklers. That includes dry and prefresh cows in the holding area. A barn with expanded area per animal has benefits. As for the future, we would like to install a positive-pressure tube ventilation system. Heifers are only bred in the morning when tail chalking is done. To access the full roundtable, as well as additional coverage of each farm, visit http://hoards.com/file-43-They-focus-on-details-and-teamspdf. As a founding member involved in the formation of the organization, I have been involved with DCRC from its very beginning in 2005. I have served on the program committee, as vice president and president. For the past three years, I have served as editor for the annual meeting proceedings of all invited speakers. I have attended all annual meetings of the organization, beginning with the 2006 meeting in Denver. I work for Kansas State University (KSU), a land-grant institution that is now 105 years old in its service to the citizens of Kansas. Its, and my, mission is to provide educational opportunities for traditional and nontraditional students, produce new technologies and knowledge to benefit mankind, and share that information through extension programs to all citizens. At KSU, I teach dairy science to undergraduates and ovarian physiology to graduate students. I also lead a seminar for teaching graduate students oral and written skills. I oversee our 250-cow university dairy teaching and research center and the Kansas Artificial Breeding Service Unit—a custom collection bull stud servicing Kansas cattle producers. I grew up in Salt Lake City, Utah, but spent my summers as a teenager working on my uncle’s half-section in southeastern Idaho. We milked cows and raised barley, wheat, alfalfa and potatoes. During my undergraduate years, I milked cows on a 60-cow dairy. I have always been intrigued by the miracle of reproduction and fascinated by the intricate biology that produces new life. The dairy cow is a wonderful biological specimen that provides unequaled protein quality milk and dairy products for the human diet. I believe our website and annual meeting have been an impetus for progress in research and communication of information to our audience–—which includes veterinary practitioners, dairy producers, and all other professionals who serve the dairy industry. These resources have become the go-to sources of scientific-based information on dairy reproduction. Going forward, dairy farms will be continued to be challenged with achieving cost-effective dairy cow pregnancy rates to positively drive revenues. One of the sessions at the 2016 annual meeting featured a presentation I gave about the history of the organization to help members better understand from where DCRC has come. You can access the full paper in the proceedings on the website, but following is a brief synopsis of DCRC’s origins. A formal invitation was sent during early autumn 2005 to a select group of individuals who worked in various roles supporting the dairy industry. The objective of the invitation was to convene a group representing different sectors of the dairy industry including academia, dairy veterinarians, dairy producers and commercial companies to create a national forum and organization devoted to improve fertility in dairy cattle. That inaugural forum occurred October 17 – 18, 2005 in the Sheraton Westport Hotel in St. Louis, Missouri. To the best of our knowledge, the individuals who spearheaded this founding forum were Drs. Austin Belschner, Fred Moreira, William Thatcher, Jim Lauderdale, Jose Santos, Gary Heinrich and Ellen Jordan. Travel and associated costs were generously supported by Pfizer Animal Health. The vision for this potential organization was to increase adoption of reproductive technologies by dairy producers to counteract the observed decrease in dairy cattle fertility. The objective of the organization was to promote direct communication between those who develop technology and products (researchers, consultants and commercial companies) and those who would benefit from such technology (dairy practitioners and producers). The initial plan was to emulate a successful model organization such as the National Mastitis Council (NMC). We ultimately believed this organization could become the main source of information, reproductive technology and management recommendations for the dairy industry. According to the 2005 bylaws, the new organization became known as the Dairy Cattle Reproduction Council (DCRC). In September 2014, DCRC officers and its board proposed to amend the bylaws to include verbiage about responsibilities of election officers, board members and committees, in addition to election procedures. These amended bylaws were approved by a vote of DCRC members at the annual meeting held in Salt Lake City, Utah, in November 2014. DCRC was granted legal status in August 2014, as a public charity under Section 501 (c) (3) of the Internal Revenue Code of 1986. A $5,000 gift to the DCRC by the American Association of Dairy Science (ADSA) provided the necessary funding for the pursuit of this legal status. In making this possible, we thank then current ADSA board member, Dr. Geoffrey Dahl, for his successful advocacy to the ADSA Board in behalf of the DCRC. DCRC may accept gifts and grants for financing the promotion of its educational, scientific and research activities or sponsoring programs for challenging and developing youth for leadership and professional responsibilities, but no part of the net earnings, if any, of said corporation shall ever inure to the benefit of any private shareholder, member or individual. I believe that DCRC will remain a strong and viable organization as long as its members remain involved and help promote its objectives to assist dairy farmers with science-based information.